Strategic Merchant Solutions will provide your retail storefront with processing solutions to accommodate them. We offer the widest selection of Credit Card processing products and solutions. SMS will provide the services necessary to meet your needs no matter your size or industry. There are many benefits to allowing Strategic Merchant Solutions to set up your merchant account, below are just a few. As a retailer your Retail Merchant Account should be fairly straightforward. You can expect the best rates and the broadest range of options, because your type of merchant account is considered to be a relatively low risk. The acceptance of all major credit cards is a key factor in the satisfaction of your customers. Strategic Merchant Solutions will provide your storefront with Retail Credit Card Processing Services to accommodate them. We offer the widest selection of Credit Card processing products and solutions. SMS will provide the services necessary to meet your needs no matter your size or industry. There are many benefits to allowing Strategic Merchant Solutions to set up your merchant account. Strategic merchant's offers many point-of-sale terminal credit card processing solutions to retail/store front merchants for face-to-face transactions. Retail merchants swipe a customer's card through a point-of-sale terminal or key-in payment information and the credit card terminal does the rest. 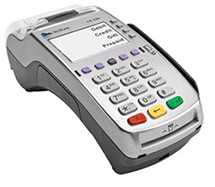 Point-of-Sale Terminals are used to process credit/debit cards, checks, smart chip cards and electronic benefits cards. You will achieve fast credit and debit card authorizations. The IP enabled POS equipment will give you 3-second transactions. We will provide dependable quality service and technical support to resolve our customer's needs. We can provide various flexible platform options, including stand-alone, networked, PC, or integrated systems. Each with enhanced features like no-show flag, one-key re-authorization, and networking. You will get comprehensive-reporting packages customized for your retail industry. We offer innovative value-added solutions for all types of retailers with integrated payment services and support for information management systems. For those that are just starting a business, sometimes it can take time to setup all aspects of your merchant account, deliver your credit card terminal, and be ready to go. You certainly do not want to wait for all of this the day before you open up shop. So, by setting up your merchant account a few weeks in advance, you can avoid all the stress and frustration and know that you will be able to accept debit/credit card payments on your opening day. We approve most business types and have the highest approval rates and lowest rates and fees in the credit card processing industry. Simply complete our Pre-Merchant Application form and a merchant specialist will call you in less than 24 hrs to verify your information and answer any question you may have or call our sales group toll free at 888.614.6300 and apply directly over the telephone. You can call our sales group toll free at 888.614.6300 for more information about our credit card processing solutions and services.